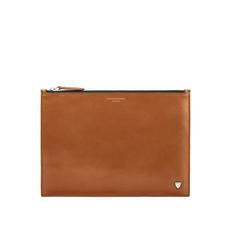 Deftly blending indispensable practicality with the stylish sensibilities of the modern executive, our handmade leather Document Cases are an essential business accessory. Discover a selection of shades and leather finishes to complement your image and benefit from the versatility of multiple pockets, dedicated tech compartments and strong yet sleek retractable handles. Whether carried by the handles or tucked under your arm, they offer a distinguished alternative to the traditional briefcase. 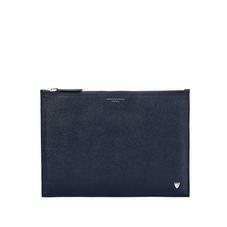 Aspinal leather document cases are handmade in beautiful Jewel Calf, English Bridle & Croc Calf Leather. The Connaught Document Case combines functionality and versatility offering the perfect business accessory for busy executives looking for a slim-line alternative to a bulky briefcase. The gorgeous Vintage Document Case is based on an elegant 1940s design and carried under the arm. 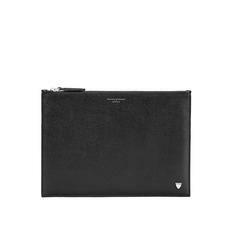 The under arm leather Document Envelope is a sophisticated, elegant way to carry important documents for meetings.